Everett 125th Celebration illustrations by (L-R) Elizabeth Person, Rosemary Jones, Deb Fox. In May I did a special letterpress printing project for my city, Everett, Washington! This is my first year as a member of Everett’s Cultural Arts Commission. One of my first duties as a commissioner was a thrilling one. Everett turned 125 years old this year, so all of the city departments teamed up to throw a celebration at Everett Station, our local public transportation hub, with each department providing a free activity for the community. The commission also does great work to enrich the City of Everett’s environment and provides a lot of free public programming throughout the year. 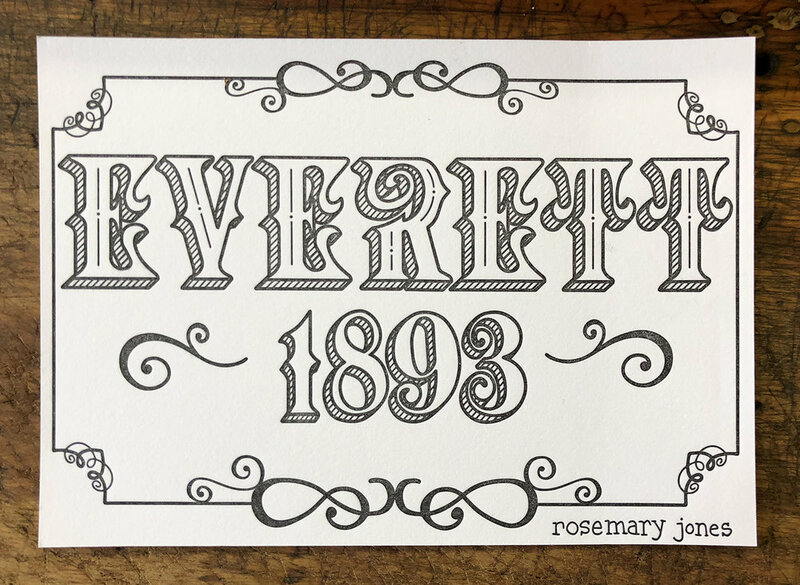 Stacks of freshly printed postcards ready for Everett's 125th Celebration. For the day of the celebration I brought my Adana Quarto hobby press and with the help of fellow commissioners Rosemary Jones and Jason Grimm (owner of JAG Artworks), we live-printed Elizabeth’s design. A young boy there with his dad watched us print and said with wonder, “It’s magic!” I one hundred percent agree with ya, kid. It was so cool seeing the excitement that lit up people’s faces and the appreciation they had for lovely artwork created for Everett by local artists. It felt good to donate my time and feel a sense of community with my city and fellow commissioners. And- to get a little deep- I always get a sense of someone’s soul when I have the honor of printing their artwork, so in turn I feel a great gratitude to Deb, Rosemary and Elizabeth for trusting me with their illustrations.